Though the Sierra Nevada extends a good deal north of Interstate 80, few mountaineers give it much attention - for good reasons. 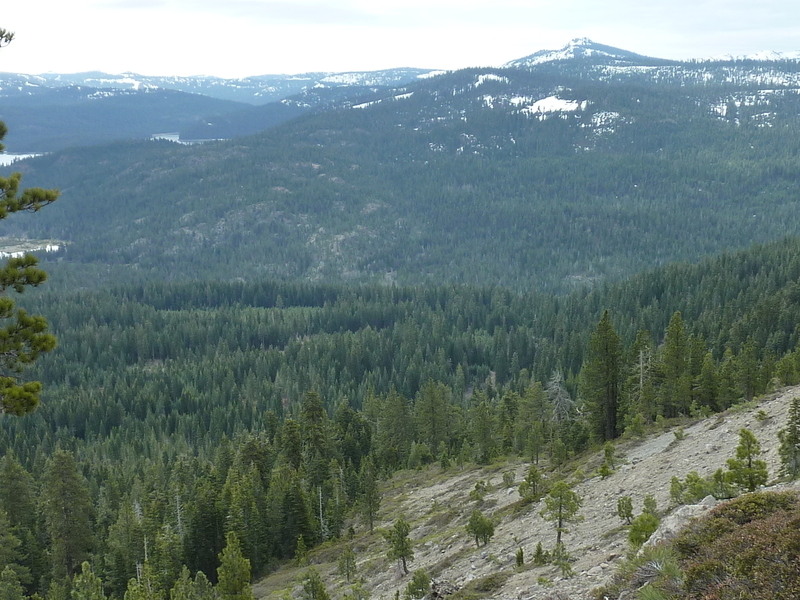 Aside from a few good-looking summits like Castle Peak and Sierra Buttes, most of it is rolling, forested terrain that provides little excitement and few views of note. Still, there are a number of P900s and P1Ks in this vast region and if one is going to make an effort to reach most of these in the state, he or she will eventually have to venture into this land of relative mediocrity. And so it was while on my second trip to Reno for yet another girls' club volleyball tournament, I headed up a few days early to get in some hiking. The area between SR49 and I-80, east of SR89 is a checkerboard pattern of USFS and private lands. Many of these private squares are timber interests, the whole area showing signs of significant logging for more than 100yrs. There were a trio of unnamed prominence peaks around Yuba Pass off SR49 that were on the agenda. I expected none of them to provide much excitement and though I had hoped otherwise, they did not surprise me. This P1K is located to the south across Sierra City and the North Yuba River from Sierra Buttes. Henness Pass Road can get one within a half mile of the summit and the unimproved dirt roads forking off from it can get one even closer. Snow would keep me from utilizing this easier option, so instead I started from the Wild Plum Campground found just off SR49 at Sierra City. By starting around 4,400ft, I would have a real climb of it. The topo map shows a trail leading to the Hilda Mine located northeast of the summit around the 5,900-foot level. Though the trail is no longer officially maintained or signed, I found it after crossing Haypress Creek and passing through the campground, having some initial trouble locating it. It would appear that folks still use the trail, though irregularly, keeping downfall cleared for the most part. I spent the first hour hiking to the end of this trail where I found warning signs for the mine and old TH signs. I didn't venture into the mine area, but turned up the old road that once serviced the upper TH. Most of these old logging roads are still shown on the 7.5' topo (there are yet more old roads that are not) and still useable, though some have become overgrown with buckthorn and other unpleasantries. Aside from the brush covering portions of them, they weren't all that helpful anyway since they tended to circumnavigate the mountain rather than go to the summit. The second hour was spent with mostly cross-country uphill, using the roads briefly before striking off cross-country again in pursuit of the highpoint. There was some snow in patches, but never very much, lots of slash from logging to trip one up and plenty of trees to block most of the views. I did find periodic views of Sierra Buttes along the way, but these tended to be fleeting and not terribly clear (overcast skies weren't helping with the views either). I found the summit is a semi-clearing, with some views to the south towards English Mtn and partial views northwest towards Sierra Buttes. In the tangle of brush among the modest summit rocks was a glass jar holding a 2yr-old register by John Vitz. Mine would make the second entry. The absurdity of what John and I were doing was not lost on me and provided some laughs. The return went much quicker, only half the time it had taken for the ascent, and by 10a I had returned to the campground, Haypress Creek, and my car at the nearby TH. This summit shares Chapman Saddle with Haskell Peak, east of Sierra Buttes and north of SR49. With nearly 1,500ft of prominence, Haskell Peak lands on several peak lists while Peak 7,605ft gets not even a name. Still, it has over 900ft of prominence from Chapman Saddle and had my attention, albeit briefly. I utilized FS Road 09, an improved road that any car can manage. I had actually been on this road before when Ryan and I had visited Haskell some five years earlier, though it was July and we approached from the west end off Gold Lake Hwy. Today I only managed a few miles up the road before being stopped by more snow than I could safely drive over. At 2.5mi from the summit, I was within the arbitrary 3mi limit I have for marginal peaks. It's not that I would refuse to hike them if I wasn't closer, because I'd probably do it even if it was 10mi. The 3mi figure is really just the point at which I'm more likely to start complaining to myself. The area seems to be signed for cross-country skiers and backroad enthusiasts. I followed Road 09 for a bit less than two miles to its highpoint west of the summit before it begins to drop to Chapman Saddle. I left the road here to head east up easy cross-contry, reaching the highpoint 20min later. No cairn, no register, no view, not much of anything other than a large boulder I christened as the summit by placing a smaller rock atop it. Yay. Heading down a slightly different route to the southwest, I came across a small rocky outcrop that I scaled because I thought it might offer the views I didn't get from the summit. Though weak, it was better. As I scurried down the slopes through the forest I couldn't help but notice the profusion of cut timber lying about the forest. It appears that folks had come in to thin the forest, cutting trees 6-12" in diameter in order to provide more room for the others to grow big and strong before they, too, are cut down and turned into lumber. Only the stuff that was cut earlier wasn't even turned into toothpicks - it was just cut up into 6-foot sections and left lying on the ground. It looks like a lot of fuel that might someday help make a wildfire worse than it might otherwise be. At any rate, it made walking through the forest less pleasant. Less than an hour and a half after starting out I was back at the van - two down and not even noon yet. Located south of Yuba Pass, the highpoint of SR49, this summit can be reached via FS Road 12, also called Yuba Pass Rd, connecting SR49 to Henness Pass Road south of the summit near Webber Lake. Snow played a much more significant role on this summit than any of the others, partly because it was the highest of the three, but also because I was approaching primarily from the north. I was happy to find Yuba Pass Rd open, but again was stopped by snow after driving in a few miles. At one point I had to get out to move a small tree that blocked the road - others had simply driven over it, clueing me in that mine was the first low-clearance effort of the season. Though stopped short, I was happy that the Forest Service did not simply gate the road closed back at the pavement until all of the snow had melted as they often do in other parts of the state. I was about 3.5mi short of my destination, but it would have to do. I locked the van and headed out. Now that it was afternoon, the snow had softened some, leaving me almost wishing I'd brought the snowshoes with me. "Almost" because the coverage wasn't uniform, at least along the roadway I traveled for two miles, as it would have been a nuisance taking them on and off. The snow was a nuisance regardless, putting my waterproof boots to the test and failing. The most interesting thing was a series of bear prints I found along one section of the roadway. It had probably been days or weeks since it had been along this part of the road. When it was time to turn off the road for the last mile and a half, the snow coverage was continuous but at least better consolidated, making it possible to make good time in boots. Somewhere under the snow was a road, judging by the various flaggings I found on some of the trees as well as the old snowmobile tracks I was following. The summit proved disappointing, a large flattish area that made it difficult to even identify precisely. I wandered around the area to make sure I had covered it sufficiently. At the eastern edge I managed to find a small gap in the trees that allowed a view northeast to Sierra Valley, the only real view I had on this summit. Reversing the route by following my bootprints back to the roadway, I was back at the car sometime before 3p. My new waterproof boots were thoroughly soaked. Now I know why they were in the bargain bin at Big 5. I hadn't planned to do a fourth peak today, but with extra time I set out to reach this P1K to the north, just south of SR70 and the small community of Portola. My first effort was to reach it via dirt roads I had identified online from the east along Westside Rd in Sierra Valley. This turned out to be a mistake. Portions of the roads I planned to use were private, gated, and inaccessible. I wandered around some dirt roads east of Beckwourth, getting eyes from some of the residents living there, eventually giving up. Another look at the road atlas suggested the west side might be easier as it shows to be more National Forest lands than on the east side. I redirected my efforts to the town of Portola on SR70, and after more wandering I came across the Beckwourth Peak Rd on the edge of town - just the ticket. With a high clearance vehicle one can drive to within a mile of the summit where the last section is gated. In the van I managed to drive the first two miles of this road, stopping at a clearing where the road conditions grew worse. Though no rain was in the forecast, the weather had steadily deteriorated during the afternoon. The sky was completely overcast and there were visible signs of rain off to the west. I wasn't so much concerned about getting wet myself as what it might do to the road - I could be stuck in a muddy quagmire should it rain any significant amount. With this in mind, I headed out before 4:30p at a steady pace, hiking up the road overlooking Portola and views to the north. I reached the gate in half an hour, continuing past that for another 30 minutes to the summit ridge. Here the road turns southwest as it reaches to the radio towers located in that direction. The highpoint is to the northeast, cross-country through some modest brush before reaching the volcanic talus piles and boulders that mark the highest point. I found the second John Vitz register of the day among the rocks in a glass jar, dating to 2011. As peaks go, it was the most interesting of the four I visited on the day. The rocky perch has a commanding view of Sierra Valley to the east and the Feather River drainage to the north, with Portola nestled in among the trees adjacent to the river. On the way back I was happy to find a shortcut trail that had been cut through the heavy brush in the lower half below the locked gate. This direct route cut at least half a mile off the long switchback the road makes as it makes its way up. It was 6p by the time I returned to the van, making for a total outing well unde 2hrs. Bottle of Fetzer? A wine connoisseur you're not. Cheers. Reply: I have no fashion sense either.